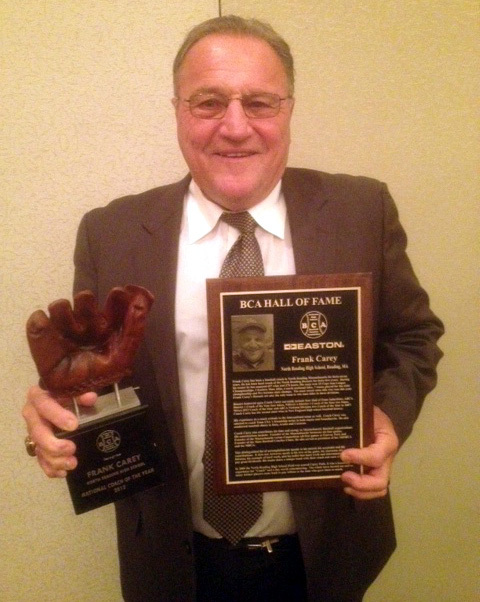 Frank Carey from North Reading High School was inducted into the BCA National Hall of Fame and was named the District 1 Coach of the Year. Frank Carey was also named the BCA National Coach of the Year. The MBCA would like to congratulate Frank Carey for these well-deserved honors. North Reading baseball coach Frank Carey was recognized by his peers as the National High School Baseball Coaches Association’s Coach of the Year at its convention in St. Louis earlier this evening. The head coach at North Reading for the past 47 years, Carey guided the Hornets to the Division 3 state title this past season. The honor capped off a special weekend for Carey, who was inducted into the National High School Baseball Coaches Association’s Hall of Fame. During his tenure, he has amassed 697 wins and 270 losses. His team won 25 Cape Ann League Championships, three Eastern Mass. titles, four North sectional titles and five state title. Carey’s Hornets are also the only team to win state titles in three divisions. Among the honors bestowed on Carey include four Hall of Fame inductions, ABCA District 1 Coach of the Year four times, NHSACA District 1 Coach of the Year two times, MIAA 2012 Coach of the Year and ABCA National Division two Coach of the Year in 2007. His experience as a coach extends to the international scene as well. Carey was selected to coach Team USA ’s friendship series in both Japan and Scandinavia. He also conducted baseball clinics in Italy, Aruba and Curacao. Carey also contributes his time and energy to Massachusetts baseball organizations. His contributions include: Founder of the Massachusetts Sectional All-Star games, Founder of the Massachusetts versus Connecticut all-star games at Fenway Park and Founder of the Mass. Baseball Coaches Clinic. He also served as president of the NHSBCA and the MBCA.